I love eggnog – it’s creamy and delicious and very festive. I usually don’t like rum, but added to eggnog, with all the sweetness and spices going on, it just works – well! Last year I made some eggnog cookies. And I wanted to make something using eggnog again this year. Well, kind of. There is no eggnog in this, just the flavours and no booze, just rum extract. I thought adding the flavours to my marshmallow fluffy frosting would work. And having this in a pie crust would be a nice contrast between crunch and mallow-softness. I decided to use oreos for the crust as I thought chocolate and eggnog would be lovely together. Crush the oreos in a food processor and add in the melted butter. Transfer to a 9” pie plate and smooth out up the sides, to an even layer. Bake in the oven for 10 to 15 minutes, just until you can smell the chocolate. Remove and allow to cool completely. Place the sugar, egg whites, water, salt and tartar in a large bowl. Place this on top of a pan of simmering water (making sure the water doesn’t touch the bottom of the bowl). With an electric mixer on high speed, beat the ingredients over the heat for 5 minutes. The mixture will turn white and thick. Remove from the heat and add flavourings. Beat for another two minutes off the heat. And the frosting is ready. Spread the fluff into the baked pie shell to an even level. Finish by garnishing with freshly grated nutmeg. There you have Oreo Crust Eggnog Marshmallow Pie ready to slice into. This tastes every bit like eggnog and is sure to get you into the festive spirit – even without the use of real spirits! Enjoy! I'm entering this pie into mine and Baking Explorer's challenge Treat Petite. This month's theme is Happy Holidays! 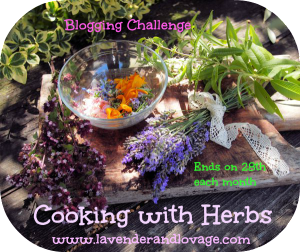 I'm also entering this bake into Cooking with Herbs hosted by Karen at Lavender and Lovage. This month's theme is spices and with the nutmeg and cinnamon is uber spicy! Festive and definitely inviting - even without real rum. It's not my favourite drink but I could certainly eat a lot of this pie. Like Stephanie says above Phil, ideal even for those of you who aren't eggnog fans! Wonder what it is about the drink compared to the flavours - maybe it's the booze! Rum extract works wonders here. Random Recipes #35 - Dare to Bare!